Whether you’re looking to simply polish warehouse floors or remove gritty oil or grease stains from your facilities, floor scrubbers help you get the job done. Rather than relying on the standard mop-and-bucket system, floor scrubbers help ensure your floors are thoroughly cleaned in a substantially less period of time. For some businesses, particularly larger ones, it makes sense to buy, store and maintain a fleet of cleaning equipment in-house. But for many businesses, renting cleaning equipment – including walk-behind floor scrubbers and ride-on machines – is a more sensible and attractive option. Efficient cleaning – Mopping is essentially moving dirt from one place of the floor to another. Once the floor dries, it quickly becomes evident that it’s not as clean as it should be. Scrubbers, on the other hand, are designed to ensure that floors are immaculately cleaned, providing a deep and thorough scrub over every inch of floor the machines cover. This efficiency means you’ll incur reduced cleaning expenses, as your janitorial team will be able to cover more ground in less time. The end results will speak for themselves. Reliable equipment – In addition to a heftier price tag, when you buy your own fleet of cleaning equipment, you’re forced to regularly maintain it in order to extend their useful lives as long as possible. If that maintenance ever lapses, there’s a good chance you’ll be stuck with faulty machinery. And even if your fleet is kept in top-shelf condition, your cleaning equipment will deteriorate over time. On the other hand, when you rent a floor scrubber, you’ll have the confidence that comes with knowing you’re getting top-of-the-line machinery that’s in great shape. Customized solutions – Some facilities are enormous, while others are smaller spaces. You’ll need different-sized scrubbing machines to get the floors of your facilities as clean as they need to be. When you buy cleaning equipment, you’re forced to use the machines you have – even if they might not be the best ones for the task at hand. By choosing scrubber rentals, you can get the exact size of equipment you need to get the job done right. Cost savings – By choosing to rent a scrubber, you’ll also enjoy the immediate benefits of more cash in your wallet. Rather than investing your money in machines that won’t be used all the time, you can keep more cash on-hand to invest in other business opportunities. In other words, by choosing to rent floor scrubbers, your cash flow becomes healthier and your business is able to grow. If you’re looking to rent a floor scrubber, you’ve come to the right place. For more than 40 years, the skilled and friendly technicians at Bortek Industries have helped businesses of all sizes find the cleaning solutions they need to make their floors are spotless. 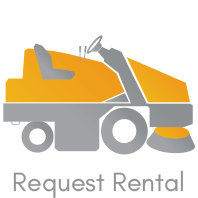 Contact us today to find the rental scrubbers that make the most sense for your specific needs.